There is more to selling than what most of us believe. In this video recording from FastWebFormula 3, James Schramko reveals his own concept of selling and how everyone has the opportunity to succeed. People buy results. [Click To Tweet]. Not every customer is a buyer. [Click To Tweet]. Be the best at what you do. [Click To Tweet]. Encourage dreams. [Click To Tweet]. Money goes to the best problem solvers. [Click To Tweet]. Money is the byproduct of solving problems. [Click To Tweet]. Authority increases sales power. [Click To Tweet]. Never need a deal. [Click To Tweet]. The best sales are undetectable. [Click To Tweet]. Eddie: Now we are here for the man, the legend, the incredible. Do they have X-Factor in Australia or was it founded here? Man, I tell you I always watch like YouTube videos and after somebody comes up and they’re nobody and then they’re just trying to explain on… and there was this one thing I keep watching, it’s one of the girls from X-Factor and she says to this guy after he performs phenomenal, she says: “People ask me what the X-Factor is,” she says. “I tell them, It’s indescribable, it’s incredible and it’s something unexplainable.” Wouldn’t you agree with me, by a round of applause, that this describes Mr. James Schramko? Let’s give it up for James! James: You like Eddie? He’s pretty funny isn’t he? By the way, I didn’t tell him he was going to introduce me today. It really demonstrates some of the points I’m making about selling today and we’re going to talk about fear. This is just what I learned about selling in 30 minutes or less. Are you interested? Alright, I thought I’d put another picture of me back in the Mercedes days because you laughed so much at yesterday’s picture, I just thought of giving you something to start off the day with. This is me in Tahiti on a Mercedes-Benz sales guild trip, they used to send the top achievers. So I did use to travel around the world. I went to Tahiti and Fiji and New Zealand. The only problem was it was for a week and it was with my other people who I work with all the time, and then I had to go back to my job. So now I do it more on my terms, and that is the whole point of this event. Whatever your situation is right now, I’m hoping that your situation can be improved by coming along to this event, and implementing some of the solutions that we talk about. I mentioned before that I was a sales achiever. This was my certificate from the ‘97 year. My first year at Mercedes, I made it into the sales guild, they only take the top few. And then the next year I won it in the whole country, within 12 months, actually. The next year I got promoted as a manager and I won that, and then two years later I won it again. You’re probably wondering, why didn’t I win it in 2001. Were you wondering that? What happened? Well, there was a meeting at head office, and they actually changed the rules, because, to quote, I’ve won too many times. And that’s one of the things I hated about working for a large bureaucratic company, where it’s like things are done because that’s how they’re always done, and I think to a large extent that’s what people think about sales. They’re still selling the same way they see other people sell, or they don’t actually understand what selling is. So, one of my first jobs was repossessing cars. And I learned a few truths about sales there. Because if you think about it, they’ve already got the goods or the service and now you just have to get the money. So it’s like a really difficult transaction. And I literally dragged a hundred cars out of people’s driveways for a year. And I was really good at it. You could virtually steal cars, and you were allowed to. It’s like a lot of fun for a 21-year-old. But I learned a few truths about selling that I don’t think are well understood. So the first one I learned was you don’t have to like the salesperson. It’s a very popular notion, and I’m sure that Cialdini was right with his research that likeability is a persuasion and influence factor. But it’s certainly not essential. Anyone here had McDonald’s? Put your hand up if you’ve ever eaten at McDonald’s. Do you like the salesperson at McDonald’s? Is that the reason you bought your burger? Or were you hungry? Yeah. You see, if you think about it, there’s all these examples of where… I checked into my hotel here. Did I order from that hotel because I liked the salesperson there? No. I checked into the hotel because I have to be here. Did people give me money for their car so I could take it off the tow truck and give it back to them because they liked me so much? No. So have we demonstrated beyond any shadow of a doubt that you don’t have to like someone who sells? So this whole thing about make best friends and all that, I will tell you: if you make best friends with all of your customers it will cost you money for another reason, and it’s to do with what Dan Kennedy talks about, price elasticity. It’s because now, you actually compromise yourself, and you start to feel uncomfortable about… It’s very hard to take a friendship and turn it into a business transaction. And probably one of the biggest weaknesses of my rookie salespeople was they thought they were the customer’s best friend. But the customer doesn’t really care, because when they drive out in their brand new Mercedes-Benz, a week later, they don’t care about the salesperson. They care about their Mercedes-Benz and what that does for them, and that’s another key element. People aren’t buying the thing, they’re buying the thing for what it does. It’s the result they’re buying. Are we on track so far? I don’t think “Pitch Anything” is the book of the year or the book of the decade. The guy is a bluffer. I read the book. I went through the whole book in detail. I went back to my sales negotiation, psychology, influence notes, to add anything that I picked up from the book that was new, and there wasn’t one thing. Not one. There’s a thousand books it’s covered in. If you know nothing about selling, it’s a really good start, but it doesn’t cover everything and I’m going to show you a few reasons why. You don’t have to know 73 tricky closing techniques. OK? It’s another myth of sales that you have to be a good closer or always be closing. The reality is, you don’t actually want to sell to everyone that you’re talking to. Not everyone is a buyer. And when you accept that, it really helps you get over the main obstacle of sales, and that is the fear of rejection. How do you define selling? Alright? 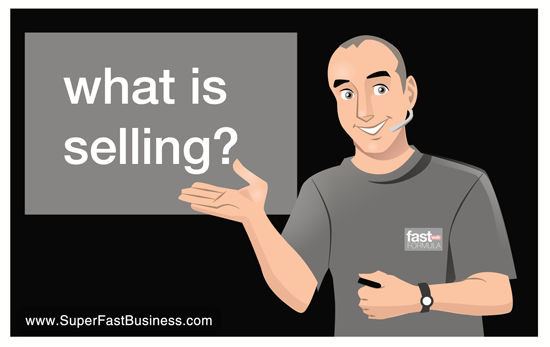 So if selling is not telling, what is selling? Do we actually know what selling is? If you look it up in the dictionary, it’ll say something like, “Establish faith, belief and confidence in the value of goods or services,” or something tricky like that. But I want to redefine what selling is for you, and I’ll draw from one of the great books that I read. And just to give you some background, before I was so successful at selling cars, I was recruited by Vodaphone when they came to Australia in 1993 to work for a sales division. And they got the best of the best of the best. They got people from Xerox, and from the telecom stores and Hutchinson, they brought them in. And these people, they gave me Brian Tracy and they gave me SPIN Selling from Neil Rackham. And these references still work now. I use them everyday in my business, and you can use them too. This is a definition that I think fits well with my values, and hopefully you can relate to this. I think selling is the process of change from one situation to a better alternative situation. You’ve heard it described many different ways. Yesterday, you heard about the cheese and the whiskers, OK? Now does that fit this model? Yes. The mouse goes from hungry to not hungry. It works. Now if this is the case, if selling is the process of change from one situation to a better alternative, obviously people only buy if they think they’ll be better off. And I just want to emphasize that people buy. We don’t actually really have to do anything to somebody to sell. It’s not something you do to somebody. It’s actually more about setting up the environment. But what it comes down to is the “What’s in it for me?” And this was covered many, many decades ago. This is the cheese. If the customer’s not interested in it, they’re not moving forward. Does this make perfect sense? This is a classic. For most people – and again, it’s covered in many, many documented books and stuff – for most people it’s they’re either excited about something or there’s a pain attached to the motivation to be better off. So when I started selling cars, it was because we were going to have a baby and I needed to increase my income. So there was a pain. I did not want to live in a cardboard box with my newly-born child. And so the pain drove me to succeed. Then when I started winning and getting that successful feeling of being the best at what I do, because I had this philosophy that if you’re going to do something why not be the best at it, and that sits well with the Mercedes-Benz thing of the best or nothing, which kind of ties in with the whole Grange philosophy, isn’t it? Create Grange. So it turned into pleasure. I actually enjoyed the competitive thing about selling. So how do I incorporate this in my Mercedes things? I sent out direct response pieces to customers saying, “AMG Test Drive Weekend Invitation.” So I’m literally saying, would you like to come in and drive a $400,000 handbuilt AMG Mercedes Benz? Now, a Mercedes-Benz owner can either say “Yes” or “No” to that. And we absolutely crushed the dealership through. We had over a thousand people coming in on the weekend. We sold more cars in that weekend than all of the other dealers combined off that direct response piece, and the campaign that went around it, which was more or less an orchestrated marketing campaign, but it was centered around who? The customer. And what was in it for them? That’s the cheese. So this is the formula that I learned, that I still use as a rough template. I trained my Filipinos on this, they make sales videos from it, I do emails around it, this will tie you into just about any scenario. So if you have nothing, just write these four things down and you are set. The first thing is the situation. In other words, where is your customer at? Where is their mind at? How do you meet them at their place? How do you walk in the customer’s shoes, so to speak? So you’re actually thinking about the customer. And I think Ed said that yesterday. Let’s think about the customer. So, my starting point is always the customer. You heard about it in my Mafia plan – the customer is in the middle. You could say, “What is it that you’d like to improve about your situation?” “What would you like to change?” With a car, it’s like, “What would you like to change about the car you’ve got now, and they might say, “Well, I want to go from a four-door to a two-door” or I want to get a bigger car or a smaller car or a more economical car or a more reliable car. So, just probing for problems. And then there’s implications. If they don’t fix the problem, what would happen? You say, if you don’t change cars, if you don’t learn that essential thing you need to know, and attend our group training offer, your business might go broke. That’s the implications. And then you just step in with the solution. What does this person actually need? So this is my basic formula. We use it all across my business. If you go and retro-analyze almost any of my communications to you, you’ll see some of these common factors. This is called spin selling, and I still think it is a great sales model because it puts the customer in front, and you are actually being diagnostic. What are the implications? “Well, if you don’t have that X-rayed, then your bone might be broken and it might heal back like this and you’ll walk around like this for the rest of your life.” And so then he says, “Well, all we need to do is do an X-ray.” Sale made. I think, well, that’s a better situation than I’m in right now. Do things like price really matter in that scenario? Has this guy tried 57 tricky closes on me? No? I still don’t know effective closes, and I’ve been selling for a long time. Because usually the customer asks me, “When can I get it?” or “What’s the next step?” They’re the right signs that you’re on track. The other thing, the big trap, is people talk about sales in logical terms, and they use the word “think.” So salespeople will say, “What do you think about it?” The customer never thinks about it. They go and they never come back. But they do feel. They buy on emotion. We are very emotional beings, and we buy on emotion. So stick to emotional words, illustrations, pictures. You might have heard the phrase, “Encourage dreams.” That’s a very common thing. It’s pretty much how all religion, cults work. They encourage dreams. When you die, you’ll go to heaven, and have all of this, and it will be amazing. That’s why people blow themselves up. They’ll go and get their how many virgins and things… It’s the dream, that’s the sale made. Dreams are very strong. So this is something that I like to do. When I was reconfiguring my SEO business, I thought, what would be the perfect dream for my SEO customer? I’m pretty sure they just want to be ranked at the top of Google. That would be their dream, wouldn’t it? So why don’t I construct my offer to make sure we talk about that, and we feature it, and then we report on it, and we can cut out all the other stuff because it’s really irrelevant. What’s in it for the customer? They want to rank on the first page of Google. This is what we do, here’s the results we get, here’s our packages, they order. Do they like us? I’m not sure. Do they want to rank on the first page of Google? Absolutely. How do I know? Because they put money into my PayPal account. Does this make sense? It’s simple stuff. The money goes to the best problem solvers. It doesn’t matter what market you’re in, your niche. Almost every area of life, if you solve problems, you’ll make money, because money’s the by-product of solving problems. Your first focus should be on how can I help someone improve their situation, and then the money will come as a by-product of that. Awesome stuff James. I’ve heard you refer to “Spin” selling for years but hadn’t checked out the book. For some reason I always had a negative connotation with it – sort of like a “Spin Doctor”. Heck, we all know that “spinning” articles isn’t cool either right? So thanks for doing this presentation and getting me out of my self limiting perception based on an unfair comparison and my complete ignorance. Situation, Problem, Implications and Needs is a powerful formula – I jotted it down on a sticky note and have it staring back at me from my computer tower at work. I appreciate you sharing this valuable information with us. How do you get to the heart of what problem you are solving? Without asking my customers, I can only think of two problems that people would have. And only one of those is something that someone would “Google” for an answer. You investigate. For example ask people what they would change about their current situation. Sometimes all you need is one takeaway and it makes catching up on all of these podcasts all the more valuable. I have a lot of time to make up, so thanks for steering me away from Pitch Anything and towards what works.